A simple tutorial on how to manually disable comments through WordPress. We’ll show you manual options, plugin solutions, and how to edit the php code to remove the comment section. Getting too many spam comments on your blog might affect your content quality and ranking in search engines. If comments aren’t a priority for you then you’re better off disabling them. In certain niches there’s barely any use of comments, so disabling them might work. Also, you might want to selectively disable comments on pages of your blog. Certain bloggers disable comments because they don’t want to spend too much time responding and moderating comments. There are two main ways to disable comments on your blog: through the WordPress dashboard itself, by using a plugin, and by editing the php code to remove the whole comments area. We’ll look the first two options below. 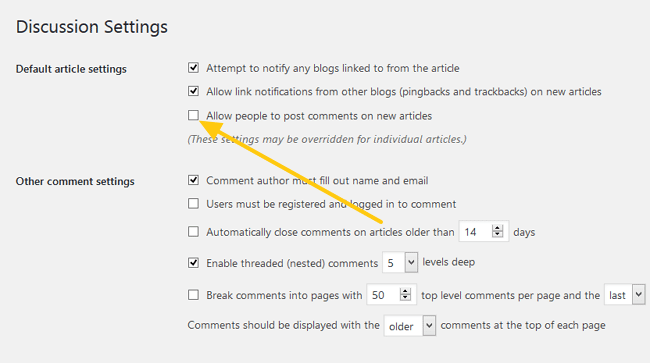 WordPress gives you a set of options to disable comments by default. To access those options, first go to Settings > Discussion. This is where you’d find all the comment related settings. To disable comments uncheck the Allow people to post comments on new articles which is activated by default, after which comments will be disabled for all your new blog posts. You can selectively enable/disable comments for specific posts or pages by scrolling at the bottom of the draft and unchecking the Allow comments option in the Discussion section. Now you can choose where you want comments to appear, or completely disable them. Here are some extra plugin solutions that allow you to disable comments in various different ways for several different reasons. Check and see which one suits your needs. This plugin completely disables all the comments on your blog. Comments won’t appear on any post or page. All the comment related sections in your dashboard and Admin panel will be hidden as well. This plugin lets you individually manage comments for pages, posts and media files. So you won’t need to separately change settings as you’ll be able to control them through the plugin itself. All the above options only disable any new comments. Though, you can use this plugin if you wish to completely wipe out all the comments from your blog. It provides another option that lets you delete only the pending comments. Before using it make sure you backup your database, just in case something goes wrong. This is good practice for any changes that you make to your blog.